I spent most of today (something like 18 hours) sleeping off the last parts of a cold, but tonight ventured out for Mary Poppins at the Re-bar. 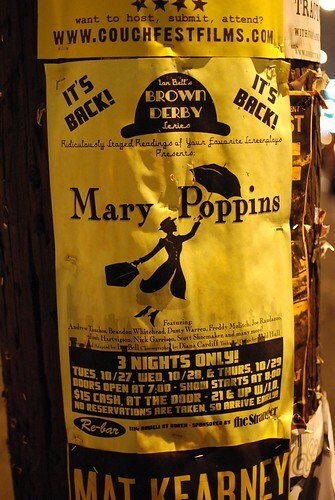 A risky endeavor to see my favorite childhood Disney movie skewered by a comedy troupe, but I left with my love of Mary Poppins intact. Sadly, I left with less love for The Brown Derby. I chalk this up to the sound mixer failing to realize how piercing the music was or how much it drowned out the actors. It was distracting and I know it pissed off other patrons around me.